In Dorking, You may often see our Dorking taxi cabs, based either at Dorking Station, Deepdene Station, Dorking West, or at the St Martins Walk taxi ranks. Our taxis are always nearby and on hand. For the surrounding areas, we are only minutes away from; Holmwood, Beare Green, Capel, Ockley, Westcott, Wotton, Brockham, Betchworth, Westhumble and Mickleham. Serving the local Hotels, we supply local Dorking taxis, to / from; The Mercure Burford Bridge & White Horse hotels, The Travelodge, Hartsfield Manor, Hayleys Wotton House Hotel & Conference centre, The Hurtwood Inn Hotel at Peaslake, The Surrey Hills hotel and Gatton Manor Golf & Country club. Serving the local schools, we provide taxis, typically for boarding pupils who attend St Teresa's school (in Effingham / Ranmore), Boxhill school and Hurtwood House school (in Peaslake). All our drivers have been CRB cleared, enhanced to Surrey County Council standards. Wedding receptions & social functions, are especially popular within our local area. Some of these venues are in very remote areas and are inaccessible by public transport. We often provide a dorking taxi, for guests attending functions / parties at; 'The Parrot Pub' in Forest Green, 'Ridge Farm' & 'Taylors Farm' both on the Rusper Road, 'Ghyll Manor' in Rusper, 'Old Green Barn' in Newdigate, 'Gildings barn' in Newdigate, 'Norwood Place Farm' in Norwood Hill, 'Goddards' in Abinger Common, 'Coverwood Lakes' in Ewhurst and 'Hurtwood Polo Club', in Ewhurst. Other local Places of Interest, that we provide Dorking taxi hire for, include; Denbies wine estate & Polesdon Lacey. Sport Events, Concerts & Exhibitions; To take the worry out of driving, parking, or public transport connections, why not hire a Dorking taxi, to take you such to / from such venues, for example The o2 Arena, Wembley Stadium, Earls Court, Twickenham Stadium, Ascot Race Course, Sandown Park, Kempton Park, Goodwood, or the Epsom Derby. Eurostar taxi transfers, as well as providing Airport transfers, we can also provide you, with a Dorking cab, to take you to / from, St Pancras, Ebbsfleet, & Ashford International Stations. Seaport taxi transfers, include Southampton Docks, Dover, Ramsgate & Harwich Ferry Ports. It is a requirement of Mole Valley District Council, that any perspective Dorking taxi driver, has to pass a local Knowledge test, in order to be granted their taxi license. The advantages therefor are, that your local taxi driver, will have an in depth knowledge of Dorking, the surrounding areas, local traffic conditions, road works & any road closures. Your driver will be able to navigate, by using the most direct / efficient route, to get you from A to B and without charging you for any unnecessary mileage! We therefor recommend, that for peace of mind, you use only a genuine local Dorking taxi service. 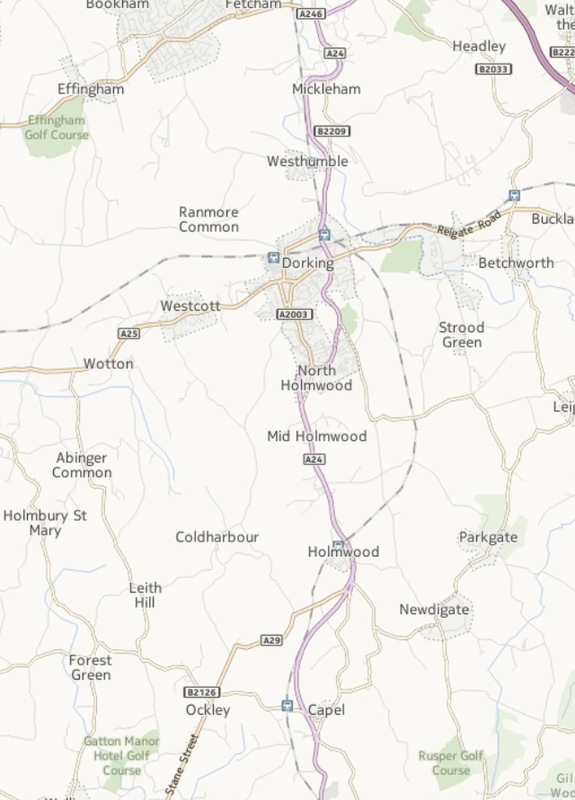 A-2-B Dorking taxi service; 'Areas covered page'.